Sinsational Smile® uses a fast and effective technology with our patented pre-filled silicone tray. This allows the jaw to remain relaxed and the person comfortable throughout the 20 minute procedure. 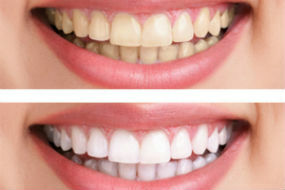 This procedure includes the use of an LED accelerating light that helps to activate the gel's whitening ingredients at a faster rate, resulting in a brighter smile and whiter teeth in less time. As part of your procedure, you'll also receive a take-home maintenance pen shown below to further extend your new brighter smile! While implants replace teeth, they are artificial and behave differently from natural teeth. A quick recap will be helpful in explaining why. A dental implant is a tooth-root replacement, to which an implant crown is attached. The crown is the only part you see in the mouth. The implant is placed surgically in the bone of the jaw to which it fuses in a process called osseo-integration (“osseo” – bone; “integrate” – to join or fuse). A great deal of thought, research and ingenuity has gone into dental implant tooth-replacement systems to make them as fail-safe as possible. The Clear Correct™ transparent orthodontic aligner system is a comfortable, lifestyle-friendly alternative to braces. Practically invisible, these innovative clear braces are an ideal solution for people who want to improve the appearance of their smile without calling undue attention to their teeth in the process. Thanks to Clear Correct™ and similar aligner systems it's now possible to straighten teeth without braces, wires and brackets. Unlike traditional wire and ceramic dental braces, which are "permanently" cemented in place, ClearCorrect™ clear braces use a series of custom-made removable aligners to straighten your teeth. Designed to work in stages, each transparent aligner moves your teeth just a tiny bit so that over time your teeth eventually straighten. In addition to improving the appearance of your smile, Clear Correct™ clear braces can straighten and align teeth that are crooked or turned. 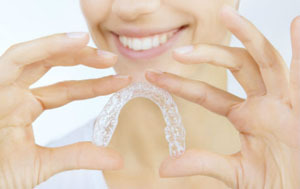 Clear Correct™ aligners work whether your teeth are crowded or spaced and can correct most overbites and underbites.